Where Darwin Meets the Bible is a book about the new anti-evolutionists, must reading for any informed biologist, and very useful reading for any parent who must endure a school board resistant to the teaching of evolution in public schools. For the last decade, intelligent design has been the dominant anti-evolution movement in the United States, claiming that the so-called theory of intelligent design is every bit as scientific as Darwins theory of evolution. It is not, of course. Unlike evolution, gravity, relativity and all other legitimate scientific theories, intelligent design is a matter of faith and cannot be disproven by experiment. Still, these guys dont go away. They are having a serious impact in state school boards and legislatures all across the country. This book is a useful primer on the movement. 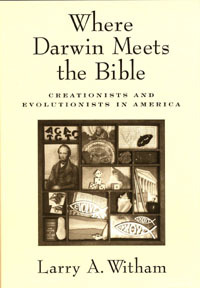 After meeting six prominent evolutionary biologists in one chapter, provided I suspect for contrast and counterpoint, Witham introduces us to six preeminent intelligent design proponents in the next, notable among them engineer Henry Morris, founder of the movement, and biochemist Michael Behe, author of Darwins Black Box, a book promoting the movement. These opponents of evolution are neither stupid nor insincere, and as Witham recounts with disturbing clarity, they are coming to weld very real political power. The great majority of scientists and informed Americans who support the teaching of evolution in our public schools would do well not to underestimate them.